The first thing you need to know when choosing zucchini, or any other summer squash, is to look for the smallest ones; they will be the sweetest and most tender. 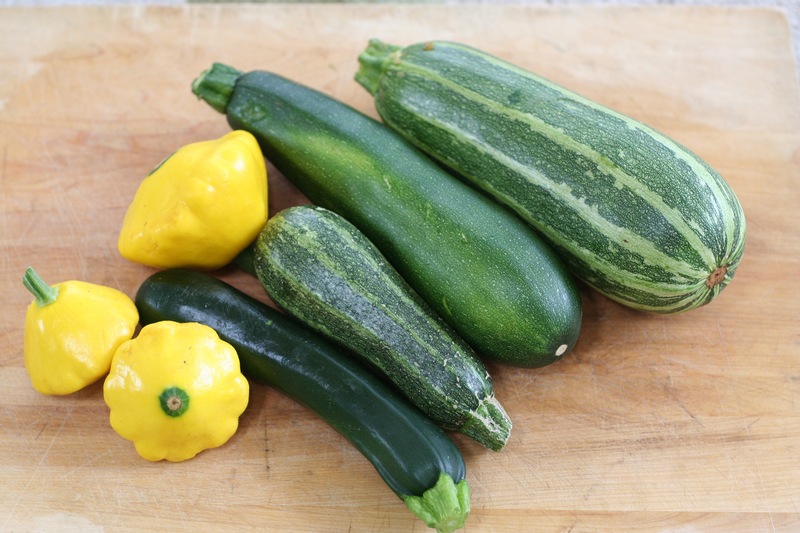 In the photo above, there are yellow patty pans, dark green zucchini, and striped zucchini. Note that I have large and small examples of each type. 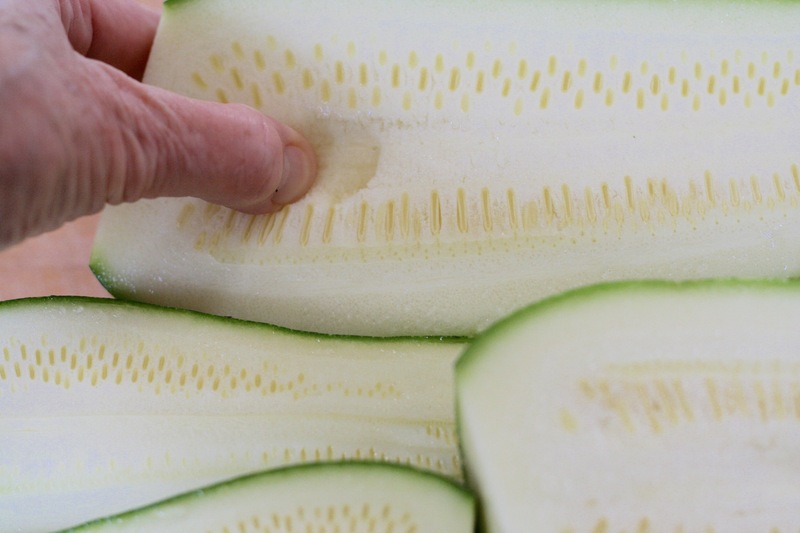 Summer squash has thin, edible skin. Look for squash without blemishes or bruises. The skin should be firm, brightly colored, and have a bit of a shine to it. 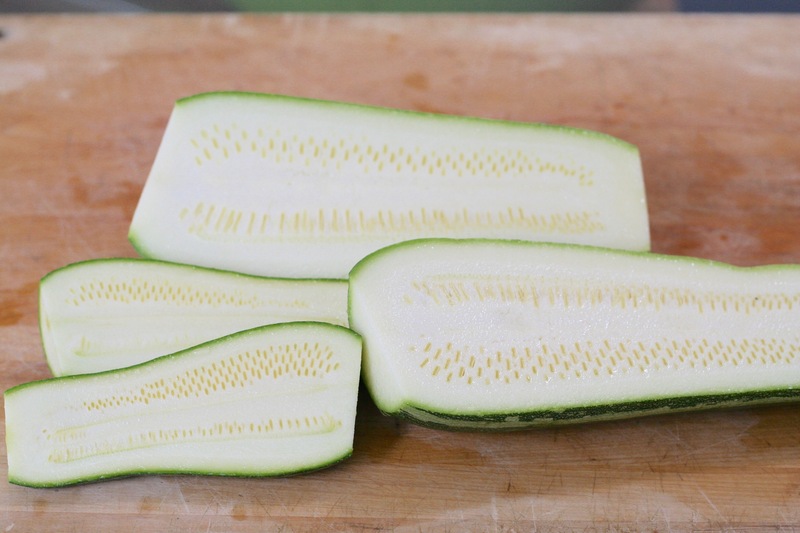 The photo above is of the smaller and larger striped zucchinis cut in half. You’ll notice in the smaller zucchini the seeds are much smaller and closer together. When summer squash get large, the center of the squash becomes soft and pulpy. Pushing a thumb into the center reveals its spongy texture. Smaller summer squash have a firm texture throughout, which is why you want the smallest available. These can be enjoyed raw or cooked. However, if you are a gardener and you find that one or more of your squash has grown to a very large size, don’t despair. I recommend that you scoop out the pulpy center of the squash before you cook it. You can always use it for soup. Slice or dice the firmer, outer section of the squash to add to a mixed vegetable soup. Or, create a puréed soup with it. Summer squash will last four to five days in the refrigerator. Store it unwashed and wrapped tightly in a plastic bag. Summer squash continues to breathe after it’s picked; wrapping it will help to preserve its flavor and nutritional value. This entry was posted in Cooking Basics, Garden and tagged how to, produce, squash, summer squash, zucchini. Bookmark the permalink.